See a history of all proposals and payments for a single client. It also includes client details, payment methods and custom notifications. 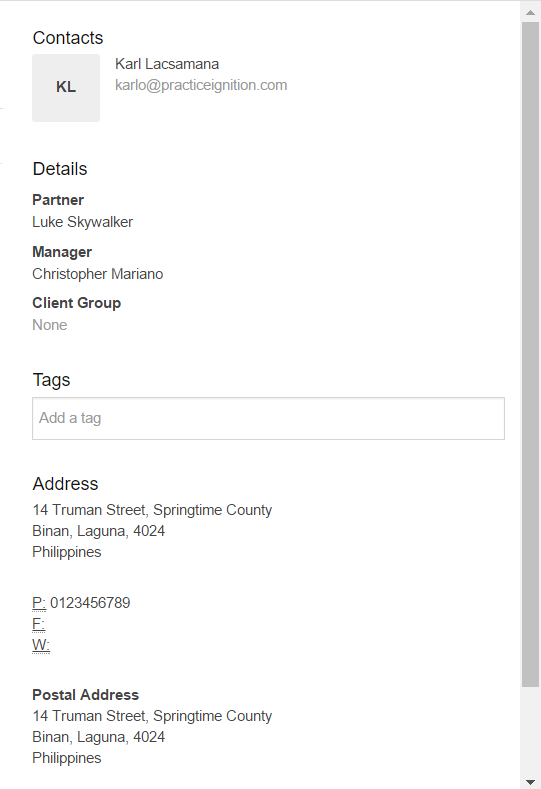 The Client Summary gives you an overview of the client's contact and address details at a glance. It also gives you visibility over their proposals making it much easier to manage your engagements with them. At the top is the entity/client name and on the right hand side you can see the Contacts, Billing and Postal address for the client. On the bottom right, you have the option to subscribe so you can get notifications from the client's proposals. Note: This will only give you in-app notifications and not email notifications. Email notifications are sent to the client's partner. If there's no partner set, the email notifications are sent to the creator of the proposal. Below is the list of all the proposals against the client with the status, start and end date, creation date, and total value. From this page, you can edit the client details by clicking on the 'Edit Client' button at the top right hand corner. Clicking on the cog/gear allows you to create a new proposal for the client, or delete the client. Note: We recently disabled our Client Portal which allowed you to 'Invite your client in' to Practice Ignition to see certain aspects of their proposal, as we are rebuilding the function. We will be re-releasing it shortly with new added features. For more information on clients, see our articles on Creating, Editing and Importing clients under the Client menu.